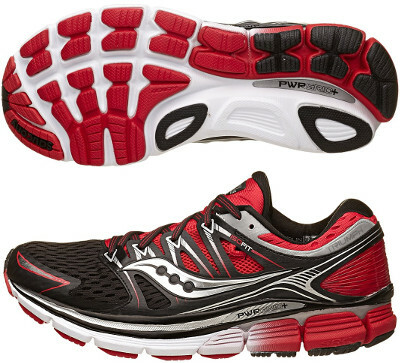 Saucony Triumph ISO are neutral cushioned running shoes. The Saucony Triumph ISO is the first model from ISO series to reach the market: premium running shoes with much more cushioning and sockless fit. Next ones on 2015 will be Hurricane ISO and Zealot ISO, which will continue the Cortana saga. This version features several major changes that would make it a new model but as long as everyone recognizes Triumph as an influential trademark it keeps the name. From its theorical predecessor the Triumph 11 changes are a major improvement in midsole and a complete new upper. Increasing the midsole height by adding 3mm of foam to both the heel and forefoot provides 20% more cushioning without touching 8 mm offset delivering outstanding comfort and more impact protection. Regarding the upper, Saucony's ISOFIT™ is basically composed of two elements: a plush inner fit sleeve and a flexible external cage. The floating support cage sits like a saddle over the fit sleeve, cradling the midfoot and moving with the runner’s foot in motion. Also outsole's geometry has been redesigned for a smooth transition using iBR+™ in more frequent impact zones to assure better response and durability.